Another really healthy side dish and this one can be thrown together in a matter of minutes with next to no cooking involved. 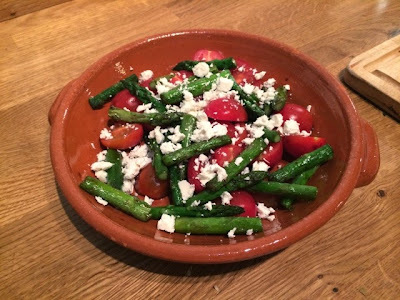 If you’re fed up with leafy salads, this sort of thing is a great alternative to your classic green salad and the sweetness of the tomatoes and the balsamic makes it seem much more like a treat than something that’s good for you. The sweetness is nicely offset by the salty feta and the asparagus though. 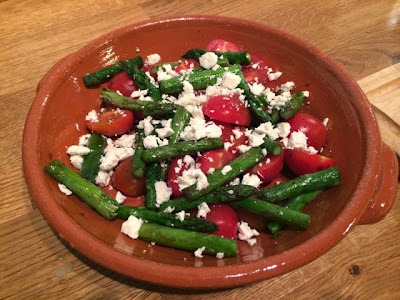 You don’t need to worry about it being bad for you because it’s covered in cheese either as feta is a strong flavour, a little really does go a long way and you only need a small amount to crumble over. 1. 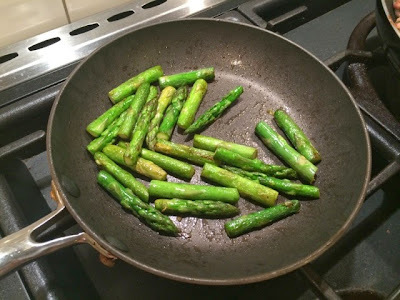 On a medium heat, gently fry the asparagus until softened but still with a bit of crunch. 2. 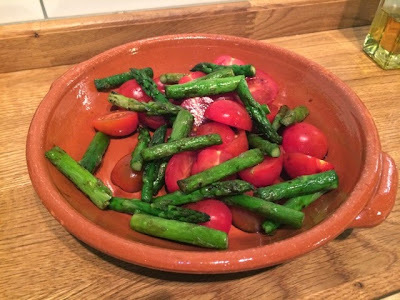 Allow the asparagus to cool a little and then throw into a bowl with the cherry tomatoes. Season with a little black pepper. 3. Sprinkle with the crumbled feta, drizzle over a little balsamic vinegar and serve.